Here in South Louisiana, we all can agree that there is a strong connection between food, family, and friends. Recipes are created, cultivated, and passed down through the generations, becoming a big reason why we gather with our friends and families. For people here in Louisiana especially, we know that spring has finally sprung when we start to smell them spicy boiled crawfish coming from our neighbors backyards, or when we pass our favorite local seafood spot. Some people call ’em crayfish, crawdads, or mudbugs, but to us they are simply called CRAWFISH, and whether they are boiled, fried, sauteed, or steamed, we just cant get enough of dem things! Over here at Cajun Works, we serve plenty of crawfish dishes. Everything from crawfish balls, to crawfish etouffee, to delicious hot boiled crawfish on the weekends. Founder & President, Toby Kimball, has been inspired by Louisiana Cooking since he was a young boy. Toby also does what he can to not only make his dining experience about the traditional food, but also involve the history of his family and the Acadians. With time lines and family history stories hanging around his cafe, it’s hard not to get caught up in the mystery and excitement of the movement of Acadian culture to where we are today. Like all Cajuns, not only do we like to cook our food; but we like to talk about it too. This blog is for your enjoyment, we look forward to sharing our recipes with you, cooking techniques, and dem cajun stories too. 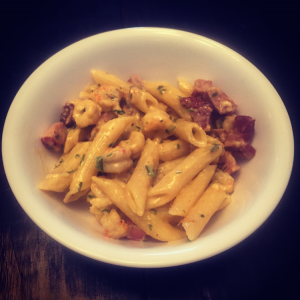 This week we are featuring a recipe around some good ole’ Louisiana Crawfish tails! You might ask well mais where I get them tails at? Leftovers from a crawfish boil? Peel dem things and throw dem in the pot Sha! Or, make a pass to your local grocery store for some good ole’ Louisiana Crawfish Tails that are always fresh and meaty. And if you just so happen to live out of state, have you some of dem tails shipped to ya house. We just can’t promise that your neighbors wont be coming back for more of that good ole’ Southern Cookin. We hope your enjoy our Cajun Crawfish & Tasso recipe, and stay tuned for more from Cajun Works, The Real Cajun Deal! Cook the noodles and cool them before starting to cook the rest of the dish. Set aside for now. In a medium-sized pot, melt the butter over medium high heat. Dice the tasso and saute’ in butter until lightly browned. Add the garlic. Stir well and cook about 1 minute. Add heavy cream, pepper, cayenne and Real Cajun Deal All Purpose Seasoning. While stirring constantly, bring to a boil and cook 2 minutes, until cream is reduced by about 1/4 and slightly thickened. Stir in the crawfish tails and parsley, return to a boil and continue to cook another 1-2 minutes until crawfish tails are heated through. Add the pasta, green onions, and parmesan cheese to the pot. Stir well to incorporate all ingredients. Let the pot sit on low heat for 5 minutes then serve.